Acquired disorders of the nervous system are responsible for considerable perinatal mortality and for a devastating chronic handicap in children. Identification of acquired lesions and their distinction from malformations can be difficult because damage to the brain in the early weeks of pregnancy disrupts the orderly and complex sequence of development and leads to structural abnormality. It is important to recognize that brain development is a continuum that begins at conception and continues into the third decade, and that damage can occur at any time in this period. 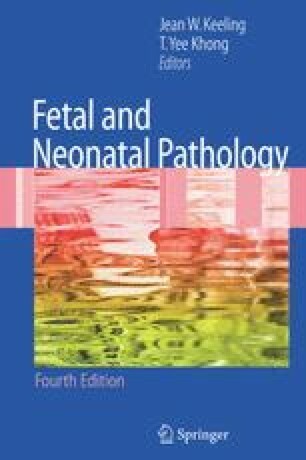 This chapter describes the more common acquired conditions likely to be encountered in routine postmortem examination of infants and fetuses. Some knowledge of the normal development of the brain is important in understanding these conditions, and excellent accounts are available in the work of Larroche (1977a) and in an anatomical atlas, Development of the Human Fetal Brain (Feess-Higgins and Larroche 1987).